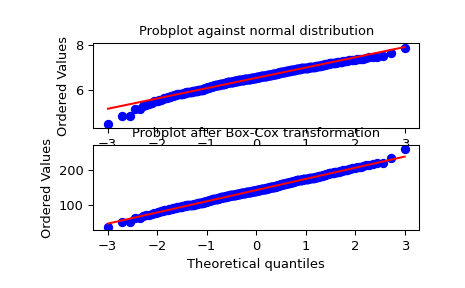 Return a positive dataset transformed by a Box-Cox power transformation. Input array. Should be 1-dimensional. If lmbda is not None, do the transformation for that value. If lmbda is None, find the lambda that maximizes the log-likelihood function and return it as the second output argument. If alpha is not None, return the 100 * (1-alpha)% confidence interval for lmbda as the third output argument. Must be between 0.0 and 1.0. If the lmbda parameter is None, the second returned argument is the lambda that maximizes the log-likelihood function. If lmbda parameter is None and alpha is not None, this returned tuple of floats represents the minimum and maximum confidence limits given alpha. boxcox requires the input data to be positive. Sometimes a Box-Cox transformation provides a shift parameter to achieve this; boxcox does not. Such a shift parameter is equivalent to adding a positive constant to x before calling boxcox. with llf the log-likelihood function and \(\chi^2\) the chi-squared function.